"Imagine you are standing on the precipice of the Grand Canyon. The beauty allures as you look in awe at the expanse before you. You quickly realize your limitations. You are about as close to this grandeur as you can get. Now imagine taking a step over the edge, free floating in the air, and going anywhere you want to go. You glide down beside the canyon wall, hovering momentarily, peeking in crevices, discovering worlds rarely seen. You swoop down just above the river below before gliding back up into the air, scaling along rock formations and floating with birds on air currents. That is the experience of scuba diving." Glen Faith smiles every time he thinks about it. "No matter how many times I dive, I never tire of it," he says. "It’s just as exciting the last time as it was the first." Glen began diving as an officer with the Illinois Secretary of State Police doing search and rescue and recovery work. His job brought him to Southern Illinois where he made an interesting discovery. "I heard about this old quarry in Mermet just outside of Metropolis. I naturally investigated!" What Glen found was a hidden treasure. The old limestone quarry was abandoned in 1972 and had been filled in with water from a natural spring. The result was a first class diving spot in the midst of the forest. "I got permission and started exploring there. I did that a couple of years until I decided I needed to open this up to other divers." In 1996, Glen took an early retirement, and Mermet Springs came to life. Nearly 20 years later, the little gem Glen found tucked among the trees and rocks of Southern Illinois is known across the country as a premiere diving destination of the midwest. 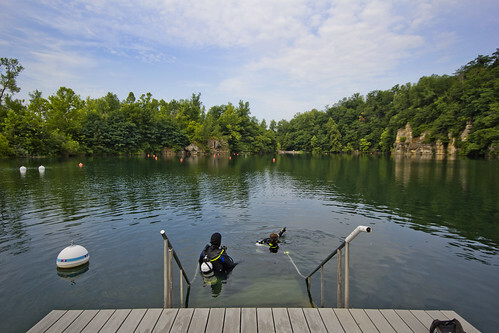 "Other quarry diving destinations existed," says Glen, "but my goal was to not duplicate another location. I wanted to raise the bar and bring it up to what quarry diving could be." Glen added full restroom and shower facilities, a campground, training pavilions, classroom areas, full gear support, and a dive shop. "My wife and I and my two sons run the business, and we now have about 40 people on staff. We are a dive destination, and we are also a place where people can come learn to dive with our instructors. 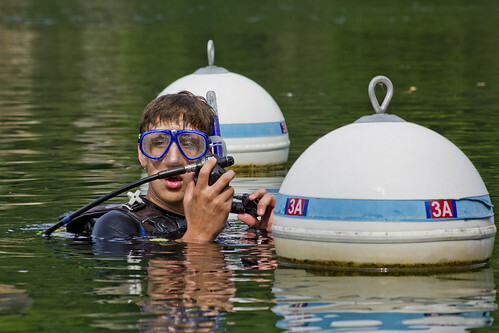 Dive shops from Memphis, St. Louis, and Chicago bring students to train here. Law enforcement and search and rescue teams travel for hundreds of miles to come to Mermet Springs. It is truly a first-class diving experience," Glen says. Glen also added underwater attractions that have sparked the curiosity of divers, dive magazines, and even National Geographic Television. "We have all kinds of things down there. There's a semi-truck, a couple of Cessna airplanes, an ambulance, a firetruck, a helicopter cockpit, and a motorcycle to name a few." Mermet's biggest attraction is a sunken Boeing 727 that was used in the movie U.S. Marshals. In the film, the aircraft is a prisoner transport plane and crashes during an emergency landing before rolling into the Ohio River. "A lady from Warner Brothers came through here to find out about using our site. She told me about shooting the airplane crash nearby, so I asked her about it. I must have bugged her for about eight weeks about getting that 727! They eventually agreed to sell it to me for one dollar. I wrote a check and pulled it out of the river and moved it here." 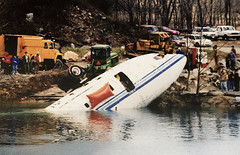 The planning of the moving and sinking of the 727 was almost as intense as the work that went into crashing it into the river. "All of the attractions at Mermet Springs are planned and placed precisely. By the time we were ready to move the 727 into place, it had become a show. We had a huge crowd and media waiting to see this thing go down!" Glen's final challenge was to flip the aircraft upright as it had been upside down since filming. His team used lift bags full of air to float the aircraft. Then the bags were manipulated in order to rotate the 727 before lowering it to its final destination. "We have managed to float a bit of everything in here," laughs Glen. "We had a train derail 18 cars at our entrance, and I was able to get one of those! Divers have a whole world down there to explore." The depths at Mermet range from five feet to a hundred and twenty feet. In the deepest part of the quarry, divers find bluegill, catfish, and American paddlefish. The monster-looking paddlefish are recognized by their large mouths and elongated, spatula-like snouts, which are longer than the rest of the head. These prehistoric throw-backs are one of the largest freshwater fish in North America and can reach 5 feet or more in length and can weigh more than 60 pounds. "You look out over Mermet, and it is beautiful. The water, the trees, the sky; it's a great place,” Glen explains. “But underwater, it is a completely new world. There is nothing else like it. That is what I love about diving. We live on a water planet. We are drawn to it. And when you dive, you get to see the rest of the world!" And Glen takes seeing the rest of the world seriously as his team rides the spirit of Mermet beyond Southern Illniois. "The world is two thirds water. How else are you going to experience it without diving? That's why we organize diving trips to places like Honduras, the Red Sea, Thailand, and the Galapagos. I've seen colors and life forms I could have never encountered otherwise. I've dived through the pages of history, looking at World War II wreckage. It has taken me places I'd have never gone. It is my passport to the whole planet!" For more information on Mermet Springs and introductory diving classes, visit mermetsprings.com.